서울은 오랜 역사를 지닌 도시이다. 암사동, 미사리 부근에서 발견된 선사시대 유적으로 볼 때 서울의 역사는 약 5천~6천 년 전으로 거슬러 올라간다. 삼국시대에는 백제, 고구려, 신라, 모두가 한강유역을 차지하면서 서울은 주요한 정주지가 되었다. 특히 풍납토성, 아차산성, 몽촌토성, 석촌동 백제고분군 등은 백제의 수도인 하남 위례성의 유적이다. 이후 통일신라와 고려시대를 지나면서 서울은 항상 중요한 지방 도시였으며, 고려 말에 이르러서는 삼경 중의 하나인 남경이 되었다. 서울이 오늘날과 같은 공간적 원형을 갖추고 도시로 발전하기 시작한 것은 14세기 말 조산 왕조의 도읍으로 정해진 이후부터이다. 당시 서울은 도심에 해당하는 사대문 안과 성저십리(城底十里)라고 일컬어진 교외지역으로 이루어져 있었다. Seoul boasts a long history that can be dated back 5~6000 years to the prehistoric ruins near Amsa-dong and Misa-ri. During the Three Kingdoms Period (1st c. BC ~ 7th c. AD), Seoul became an important settlement, as the three kingdoms contended to occupy the Han River area. Pungnaptoseong, Achasanseong, Mongchontoseong, and the ancient tombs at Seokchon-dong consist the historic sites of Hanam Wiryeseong, the capital of Baekje kingdom. During the Unified Silla kingdom and Goryeo Dynasty, Seoul continued to be an important regional city, earning the name Namgyeong (South Capital) as one of the three central cities of the Goryeo Dynasty. However, it was only after its designation as the capital of Joseon Dynasty in the 14th century that it came to develop and be established into its current spatial form. It was for this basis that Seoul was able to develop into one of the great historic capitals of the world. <경조오부도 京兆五部圖>는 김정호가 제작한 전국지도인 〈대동여지도 大東輿地圖〉에 수록되어 있는 지도 중 하나이다. 《대동여지도》는 김정호가 1861년에 발간한 약 16만 분의 1의 대축척 지도이며, 22첩으로 구성되어 있다. 경조오부도에는 도성에서 지방으로 연결되는 도로들의 이름이 기록되어 있다. 삼각산 서쪽에서부터 고양로, 고양간로, 행주관로, 강화도, 선유봉 쪽 인천간로, 영등포 쪽 인천가로, 시흥간로, 시흥로, 과천로, 용인로, 광주로, 광진간로, 양근로, 가평로, 양주포천로 등 15개의 도로 명칭으로 보아, 실제로는 서울 인근에서 지방으로 연결되는 도로가 《여지고》 《도로고》 《대동지지》에 나타난 것보다 훨씬 더 발달되어 있었음을 알 수 있다. The following is Gyeongjo-o-budo, from Kim Jeongho's map of Korea, Daedongyeojido. 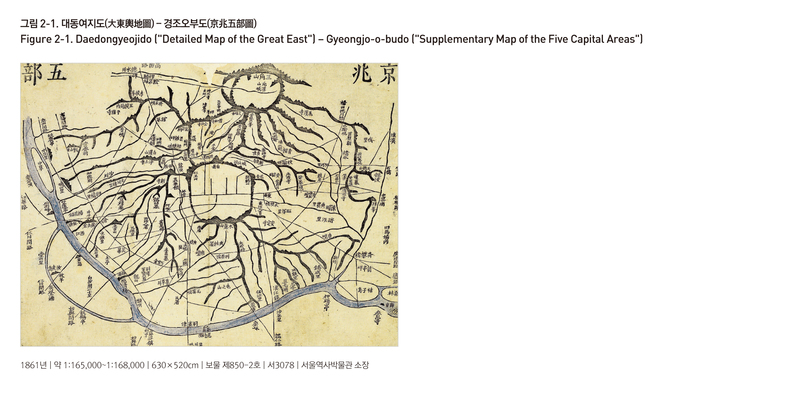 Published in 1861, Daedongyeojido is a large-scale map drawn on a scale of 1:160,000 and consisting of 22 sections. An interesting part of the map is the roads that lead out from the capital into the provinces – a total of 15 distinguishable road names, which indicate that the road systems connecting the outskirts of Seoul with other parts of the country were much more elaborate than was shown in other maps of the era. 그대로 좇은 것으로, 좁은 지면에 넓은 주변지역을 간략하게 보여줄 수 있는 장점을 지니고 있다. Collection of Seoul Museum of History. 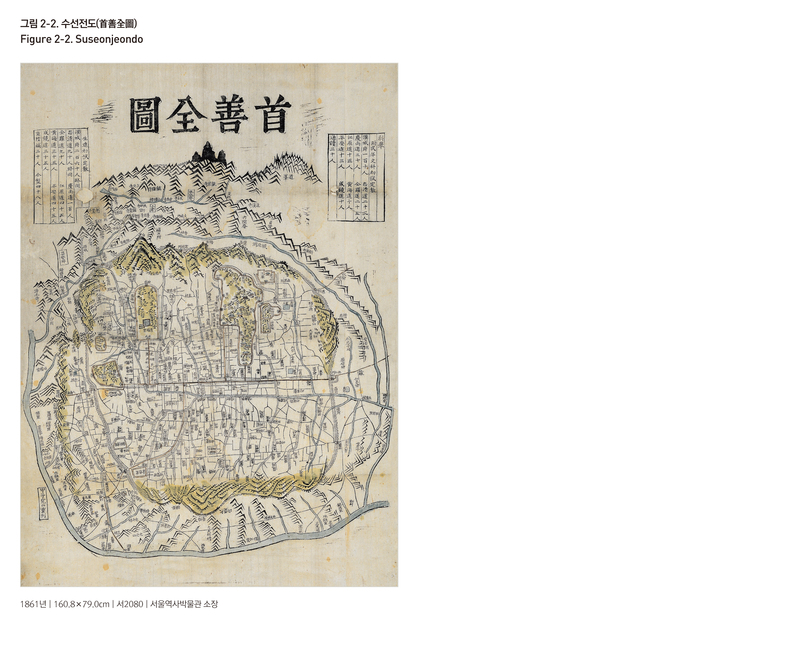 Suseonjeondo is a woodblock print map that is nearly identical to the woodblock Suseonjeondo at the Korea University museum. The words 'Suseon' derive from a saying from the Chinese literary classic Shijing (詩經) which states that the deed of building the utmost form of good begins at the capital. Therefore, the meaning of 'Suseonjeondo' would be the 'Jeondo (全圖, complete map)' of Seoul. Suseonjeondo at Korea University is thought to be the work of Kim Jeongho. There are differing opinions on the exact date of the work, but, assuming the historical life span of Kim Jeongho to from about 1800 to 1860, it is likely that the work was created some time during the 1840s. Suseonjeondo from Seoul Museum of History was printed from woodblock and lightly colored in for the depiction of mountains, streams, and major palaces. The scale of the map is consistent inside the city, but shrinks outside the city walls. Following the practices of Doseongdo, a preceding map from the King Yeongjo/Jeongjo era, this cartographical design has the advantage of providing a concise introduction to the wider geography of the greater out-skirt regions without dedicating too much map space.